Lady Fingers. That's what I think about when I see this room. Now. I'm not talking about your mother's long tappery phalanges designed specifically to remove that little ball of cotton from the bottle of children's aspirin when you had a headache or to gently touch your forehead to test for fever. No, instead of that moment of tenderness before you close your eyes and drift into dreamland, I am talking about the light and sweet sponge cakes Mom served on the veranda when I got home from school before I did my homework; always served on the "good dishes", a cup of coffee in an eggshell china cup. For that brief moment, I was transformed from vulgar hellion to cultured gentry sipping coffee, laughing appropriately, dabbing the corners of my mouth with a linen napkin. Fondness for the days of biting into the soft cakes and a little shot of cold crÃ©me filling my mouth. It is one of those moments that I relished as a boy - just me, my mom and the lady fingers. I would tell her about my day and, whether she had a million things on her mind or not, the details of my mundane existence were the most important news to her. Paper plates or Limoges China; Twinkies and Kool-Aid or tea and crumpets: create your own lasting memories in this quaint little breakfast nook. The room exudes charm, maintains optimal functionality and avoids that cramped, "overdone" feeling. The sheer vertical blind panels provide privacy while they allow a delicate touch of sunlight to diffuse across the dark oak laminate floors and gently caress the brass finish on the lamps and glass-top table. "Good to the last drop," as they say. One of the most amazing features of this room, actually, is what goes on outside the room. The classical Romanesque columns provide a powerful threshold bearing the "weight" of the massive vaulted ceiling seen here. Actually, they don't. Traditionally carved from a single, huge piece of stone, columns were used frequently in Roman architecture to do just that - bear the weight of the world; these days, the need for such structural pillars have given way to stronger building materials and more practical designs. 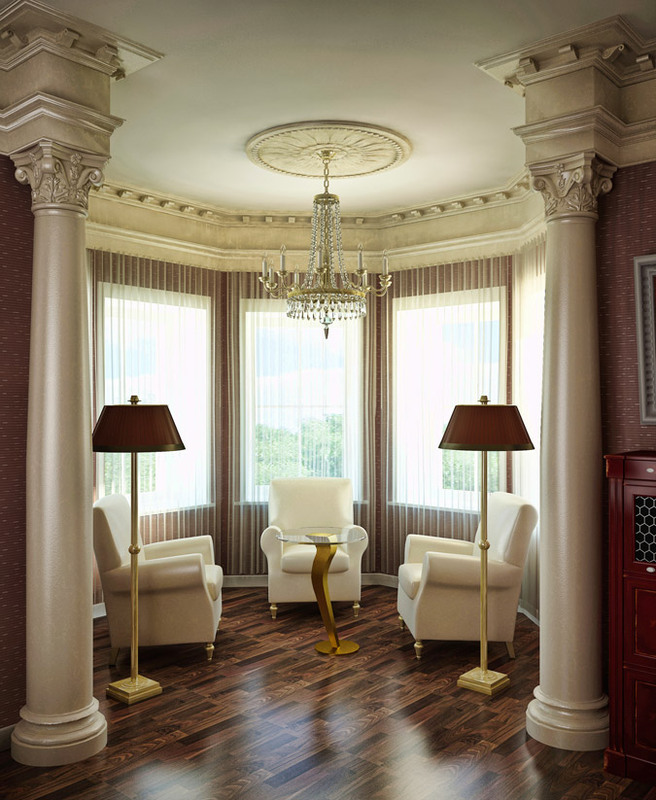 But, to retain that classic look, use our polyurethane columns with Romanesque capitals. They are easier to work with than solid stone while retaining the classical architectural aesthetics. And, you don't get that bad rep for using slave labor to construct such audacious edifices. 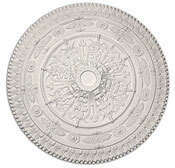 Ceiling Medallions turn your ordinary ceilings into a traditionally beautiful decorative space. offers many popular urethane ceiling adornments with classic decorative elements, such as traditional acanthus leaf, floral, or even heart patterns. Choose a medallion such as our MD-9127 to supplement your design. Need Help Installing your New Medallion? 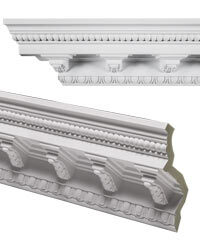 For the Crown Jewel of your palace, choose our CM-1007 Crown Molding. Perfect for your vaulted ceiling. Let them eat cake!